Sparks from the fire pit dance towards the starry sky. Explore the trails surrounding you. Soak in the jetted bath tub after a long day of adventure. Only 15 minutes to downtown Bryson City and rafting. 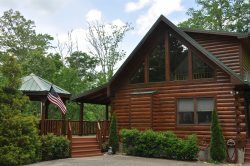 On a wooded hillside, Wolf Ridge features two bedrooms and two baths. Relax on the covered porch or the deck and take in fresh mountain breezes. The vaulted ceiling makes Wolf Ridge feel spacious. Gather around the stone gas fireplace for warm memories. Brilliant starry skies will shine down on you as you enjoy the fire pit. Don't forget marshmallows! Cooking is a breeze in the fully equipped kitchen with stainless steel appliances and gleaming granite counters. The main floor bedroom has a Queen bed and a bathroom across the hall. The upstairs loft bedroom has a queen bed and a private bath with a jetted bath tub. Wolf Ridge is conveniently located to outdoor adventures. Hike directly from the cabin. White water rafting is just a 15 minute drive from the cabin on the Nantahala River. The Great Smoky Mountains Railroad with themed train rides is also fifteen minutes from this centrally located cabin. Stand up paddleboarding is just fifteen minutes away on either Fontana Lake or the Tuckaseegee River. Wolf Ridge is available year round and sleeps 4. - "It has been wonderful. What a cabin. Everything and I mean everything has been comfortable. The views are amazing." For more reviews, please click on the Reviews Tab. 2 Bedrooms & 2 Baths: The Loft Bedroom has a Queen Bed and Private Bath with jetted bath tub. The Main Floor Second Bedroom has a Queen. Both bathrooms have tub and shower combinations. Maximum capacity of up to 4 is based on county guidelines. We booked this cabin fr our 10 year anniversary. We have had a wonderful time and love staying here. We even went Hot Air Balloon riding in Asheville. It was amazing. Very good. They responded nicely and cordial. Thank you for your excellent work. It was indeed a time to be relax and enjoy the view. We had a great time. Is not the first time we booked with your company. We enjoy the properties and the good treatment. The members of the Great Smoky Cabin Rental team were very helpful with answering all of my questions and addressing my concerns. We had a very memorable stay. The cabin was very impressive and exceptionally clean! We have nothing but good things to say and we are very grateful for the opportunity. We walked down the mountain to the main road and back very refreshing. We also visited The Great Smoky National Park and Deep Creek (highly recommended). Thank you for the great memories. We picked this cabin for our honeymoon and I don't think we could have chosen a better place. Everything was perfect. Thank you so much for making our travel more enjoyable. Considering this was our first time driving up and staying in the mountains. The cabin was the perfect opportunity to reconnect. Very helpful staff. Nice cabin with excellent view. Team was very friendly and informative. Loved the property, we had a great time. Very friendly and courteous folks, went out of there way to help. Very relaxing, nice not to be cooped up in a little hotel room. Cathie and Kelli were excellent to work with! They had great customer service and even called to check in and ensure we made it to our cabin! Thanks for a wonderful stay in a beautiful home. Our son appreciated the comforts of home on a short break from his AT journey. Everyone was professional. We liked the seclusion of the cabin, enjoyed the view, as well as the firepit. We went over Memorial Day weekend and this was one of the nicest for the price that was still available. We were a little concerned about the four wheel drive requirement, but we had no problems with our four wheel drive Honda Element. ========Managers Note: The owner of Wolf Ridge has had the section that needed 4WD paved, so this property no longer needs 4WD to access it as of June 2014. Everyone I spoke with was Great!! On the directions it reads turn after the old store, it should say yellow store - it would help. You need 4 wheel drive to get up the driveway of the cabin, we had it so no problem, but need to stress that fact. Have to have it, tried to go up it without, and could not make it. We did not have wireless internet, thought it was on the sheet in the cabin, but did not have, no big deal, just thought if it was suppose to be in the cabin someone would like to know it was not. Not only was the Wolf Ridge cabin perfect, but the staff was was also. They even called Thanksgiving day to make sure we were ok during our travels. My family will definatly be staying with Great Smokey Cabin Rentals again. The cabin was beautiful. My family and I loved the scenic porch views and the open floor lay out.